Luis Suárez continues to grab all the Premier League headlines. In a week in which he was named on the shortlist for the PFA Player of the Year, the Liverpool striker attracted controversy once more when he appeared to bite Chelsea defender Branislav Ivanovic on the arm during a tussle in the Chelsea penalty area. The officials did not spot the incident and Suárez escaped unpunished. Once the authorities study the footage though, the Uruguayan could face another lengthy ban. Suárez is already notorious in English football for the charge of using racist language against Manchester United’s Patrice Evra for which offence Suarez was banned for eight matches. Suárez later apologised to Ivanovic. "I am deeply sorry for my inexcusable behaviour earlier today during our match against Chelsea," he said. "I have issued an apology and have tried to contact Branislav Ivanovic to speak to him personally. I apologise also to my manager, playing colleagues and everyone at Liverpool Football Club for letting them down." Suárez later confirmed on Twitter that he had contacted Ivanovic. "I've just spoken to Ivanovic on the phone and I could apologise directly to him. Thanks for accepting," he tweeted. 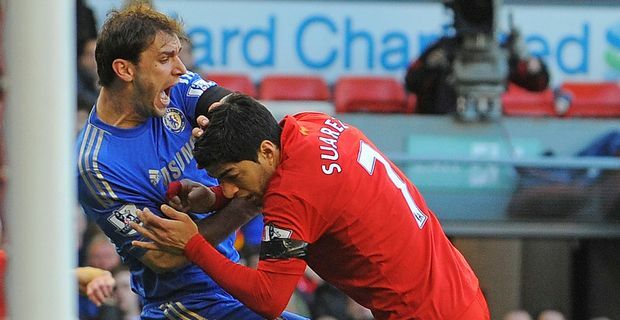 Suárez has past form for biting opponents. While playing in Holland with Ajax, Suárez was given a seven match suspension for biting PSV Eindhoven’s player Ottman Bakal on the shoulder in 2010. Adding insult to injury it was Suárez who cropped up to head an equaliser for Liverpool in the seventh minute of stoppage time. His goals have kept Liverpool’s Premier League position respectable this season. His antics continue to damage the club’s image. It is only a few weeks since the Liverpool manager Brendan Rogers spoke about Suárez’s "amazing appetite." Now Rogers has told the player that nobody is irreplaceable. "It's not for me to make any rash comments or any predictions now," Rogers said, "but this is a football club where historically players treat people with how the football club respects society, players and everyone. I will review it and we will review it as a club. There is certainly no one bigger than this football club, as a player or a manager." That can’t help sounding like typical Rogers verbiage as, without Suárez this season, Liverpool would be flirting with relegation.